The average cost of 60-minute American Sign Language lessons is $54. While the exact cost will vary depending on the teacher, type of lesson, and your location, you should expect to spend anywhere between $15 and $155 per hour. For the best experience, we typically recommend 60-minute American Sign Language lessons. However, students looking for a more affordable option may want to consider a shorter lesson length of 45 or 30 minutes. On average, 45-minute American Sign Language lessons are 17% less expensive at $45, and 30-minute lessons cost 41% less at $32. Curious how much American Sign Language lessons cost in your area? Do a quick search to get local prices for the best American Sign Language teachers . Students are raving about their American Sign Language instructors on TakeLessons. Check out some of these recent reviews. "Love Joy......She is the best and nice. Love my classes." Fayetteville, AR teacher: Joy B. "She gives background, not just signing. Shes so adorable and informative." McAllen, TX teacher: Victoria G.
"He is getting even better he likes to be encouraging and honest reviews from his students I had a feeling he would be great I just had to get to know him. He'll never intentionally hurt your feelings and I really recommend him. He also teaches Piano and guitar I heard as well as ASL (American sign language). He lives in the Philippines. Ignore my yesterday review." "You are a great teacher! Thank you for teaching me sign language." "Such a fun time! I’m learning a lot!" rom you, and you are one of my favorite ASL teachers. s a great personality and is a super teacher. She knows how to get her point across and will spend a lot of time learning the best way to teach each individual student. She really cares about all of her students!" Ionia, MI teacher: Carla C.
"Fantastic instructor, patient and enthusiastic about sharing the ASL language. Absolutely enjoy working with her." ants to learn by signing her schedule and things about her, this makes her excited every time. I definitely recommend Victoria for any age. Her enthusiastic attitude makes every lesson a delight." Amazing Teacher and had a great experience! I have tutored American Sign Language (ASL) during my time as a member of Kappa Sigma Fraternity at the Rochester Institute of Technology (RIT) and as a federal employee. With my Deaf experience and experience with tutoring ASL, I can make tutees feel comfortable with talking in ASL and talking with Deaf people, Hard-of-Hearing people, and Deafblind people. As for a book, I recommend “Basic Course in American Sign Language” authored by Tom Humphries. Super patient instructor, provided a very immersive learning experience! I've been teaching American Sign Language for 5 years, and signing myself for 18 years, and my students have gone on to develop a love for ASL, Deaf people, and Deaf culture. Within the first few lessons, you'll be able to carry on a simple conversation in the language, and as time goes on you'll be able to feel totally at ease with Deaf people. I have great online tools you can use for free to practice between lessons, and I'm flexible with any other resources we use. I can't wait to meet you! Have you ever wanted to learn American Sign Language, but couldn’t find out where? Here is an opportunity for you to learn at your pace and your convenience. I first began learning Sign Language back in 2nd grade. In high school my school offered both ASL 1 and 2. I then became more interested in the Language and decided to major in Deaf Education. I have been in the Deaf Education field for 6 years now and I enjoy helping my students communicate using ASL. I hope to connect with you soon! Ava is a great teacher. She will be on time and prepared. She is thorough and her signs are very clean and precise. Ava is patient, kind and flexible. If I were to relate her interpreting or signing to an audible language I would say she speaks proper. I love watching her sign. Im native ASL since birth. I am Graduation Student to become an ASL instructor. I've worked in school education over three years within the private and public school and Deaf school to teach ASL, Mentor and help students to learn ASL. I love learning from Purnima! Not only a I getting fully immersed in language, I get to learn about Deaf culture. Purnima makes learning vocabulary easy, and takes the time to answer questions if something doesn't makes sense. She is so sweet and kind, and I would recommend any classes with her. this is the best asl class here in my opinion. it covered a lot. and helped me review and remember some stuff i forgot from not being active in the Deaf community here. Her patience, sweet demeanor and attempt to answer every question yet keep on task is impressive. Do you want to take ASL lessons with the perfect teacher near you? If yes, then you’ve come to the right place. Private ASL lessons and classes with a TakeLessons Certified™ teacher - whether in-home, studio, or online - accelerates your progress, increases enjoyment, and improves every student's chances of becoming a proficient user of the ASL language. Private tutoring makes learning easy, it's more affordable than you might think, and it's the most impactful way to improve your skills for beginner or advanced learners. Our ASL tutors work with students of all ages: kids, teenagers, adults, and even seniors. They can teach you the origins of Sign language, in addition to the vocabulary, the grammar, the punctuation, the consonants, the vowels, allophones, sentence structures, gender differences, accent reduction, and other technical aspects. 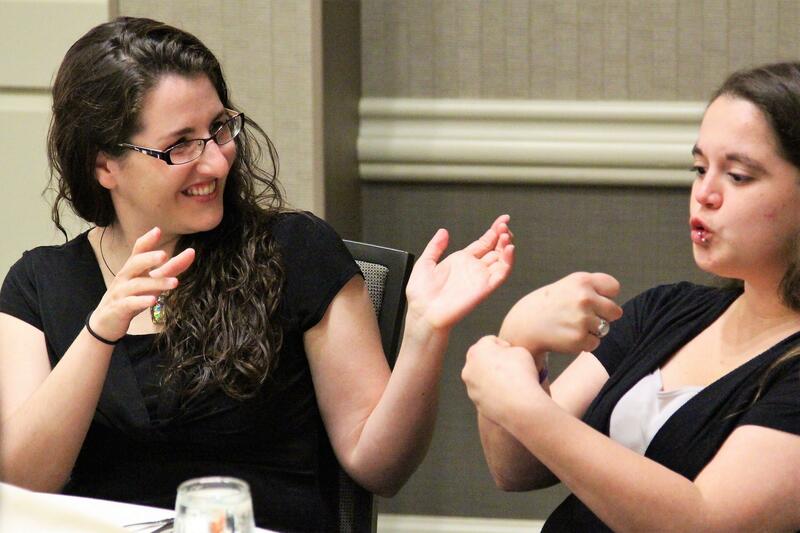 Learn about and experience the physical, social, and emotional benefits of learning ASL. ASL can take up to 30 weeks, or 750 hours, of deliberate practice to gain General Professional Fluency. A private tutor can help keep you focused, committed, and motivated, not to mention their ability to help you overcome any language hurdles you have trouble with. Your tutor offers you expert language learning techniques and tips, and helps you develop good practice habits, so that you can maximize your learning experience, and achieve your goals faster. Learning ASL is extremely useful for both the Deaf and the Hearing, because it helps with career prospects, academic performance, business opportunities, and personal relationships. Become a better ASL user and communicator. Students taking online American Sign Language classes benefit from greater convenience, enjoy better rates, and can choose from a wider selection of teachers nationwide. If you've ever taken any language classes over Skype, you'll love using our interactive TakeLessons Classroom. For independent language learners, downloading popular language apps - free and premium - or checking out ASL books from the library are excellent options. They cost less overall than private lessons, and allow you to learn at your own pace, on your own time, and the topics of your own choosing. The downside is that you don't have personal instruction for the times you need to overcome any challenging obstacles. Learning with a partner or a teacher gives you the personal interaction you need to verbally practice and attempt the language. Taking small group classes to learn a new language is another good way to acquire basic language skills, immediate feedback, and human interaction. It combines both passive and active learning. A professional instructor leading the class can keep the agenda tight and ensure each student gets the chance to participate, and get their questions answered. It can also be more affordable than private 1-on-1 lessons. Find local group classes near you by doing a quick Google search, or better yet, sign up for TakeLessons Live, the new and affordable way to learn ASL and other languages, and to learn how to play musical instruments in small groups of 5-8. You pay a flat monthly or annual fee, and get unlimited access to hundreds of classes online every month. Perfect for beginners.